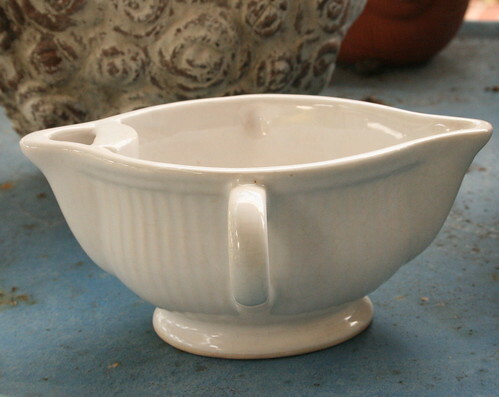 Vintage gravy boat , originally uploaded by Temeculamom. Thank you for your encouraging messages and prayers. They have meant so much! It looks like my son’s records have finally gotten to the expert in Los Angeles (I am just awaiting confirmation today), so that is great. And the other good news is that he hasn’t had any episodes of tachycardia (rapid heart rate) in several weeks, so while he still has the condition, he may well have it to a lesser degree than he did before. That is what we are hoping. In the meantime, I have been busy as usual with life and love and children. My oldest will be starting high school next year. We are so lucky that we have some of the best high schools in the country here, but you really have to jump through hoops filling out paper work and getting the forms done correctly. I spent much of this week making sure we didn’t miss a thing. Despite my hectic schedule, I was lucky enough to meet up with a new blog friend, Karan. She is just as much fun as her blog in real life! We have gone shopping together twice together now, and I could be in real trouble, because I need to behave myself and not give in to temptation!! She is a real kindred spirit. She had me over for tea one morning with gorgeous vintage tea cups, real whipped cream with vanilla and Earl Grey tea. Yum!! Her house was so full of amazing vintage finds, altered books and other artwork she had created, you could just explore for hours. I think I almost had a lust attack. I need to restrain myself to only shopping one or two days a week with a really strict dollar limit, so I don’t get into trouble. Here are a few of the goodies I came home with recently. I also found a great old galvanized mop bucket for planting in, 3 stackable black pyrex mixing bowls, a vintage porcelain and brass clock (that I stood up and shattered! 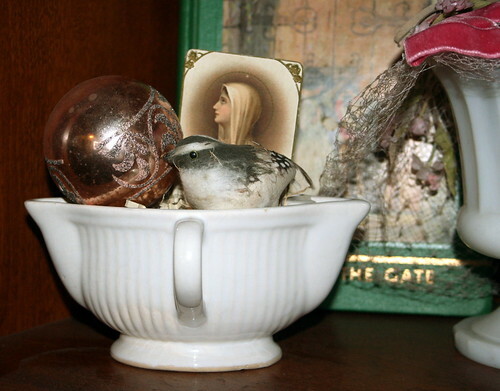 ), a stack of vintage sewing patterns, a wood and glass serving tray and a whole lot more. Karan is going to be a whole lot of fun!! And she has art parties at her house too!! 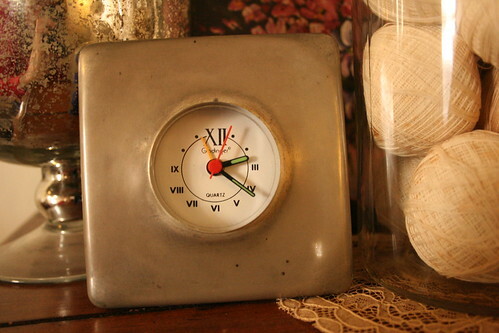 How about this old silver clock? 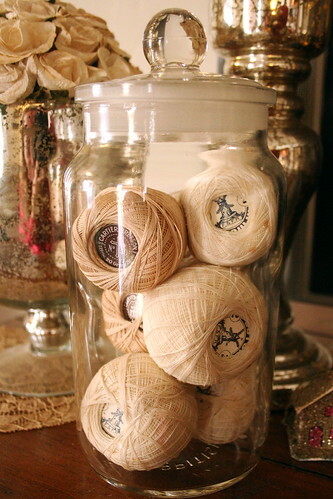 Or an apothecary jar full of vintage French embroidery floss? ~ by bekaboo on March 11, 2011. OOhhhhh, what great finds! Love the jar. I hope you find some treasures on Sunday.